The tradition of having dinner with the entire family in a restaurant is dying out in Greece. Thanks to the crisis, another piece of culture is becoming something for the history books. Long live the dictatorship of the European Union that not only tries to starve one of his member states but with its pernickety rules in keeping people healthy, only manages to make them very unhappy. Geert Wilders, an ultra rightwing Dutch politician, is right in saying that the Greeks spend all their money on souvlaki and ouzo: they also have to eat and drink, don't they? Souvlaki (compare it to fish & chips or a hamburger) is at least something Greeks can still afford once in a while. Dinner in a restaurant, where prices are continuously on the rise, has become a rare event, now only to be enjoyed on celebration days, and expensive whisky, once number one drink in Greece, has been replaced by the much cheaper ouzo. Here on Lesvos it's now only tourists that visit some restaurants, the others becoming a sitting room where a mother waits with delicious dishes for husband and children, while the heroes of the village or the favorite singers from yellowed photographs look sad down at the empty room. As soon as the tourists begin to disappear, the restaurants that were able to open during the summer season, will close for the winter. Europe can dictate what it wants, but it will never – especially on Lesvos – be able to destroy the entire food culture. The few tourists who realize that the island is not entirely filled up with desperate refugees, know what to expect: an island as proud as a peacock, with breath taking nature, its traditional villages and secret beaches, its lovely restaurants spread all over the island offering a culinary adventure, an island where during the summer a large range of festivals are celebrated: from traditional and classic music festivals to folklore and tango events as well as ouzo and sardines festivals. 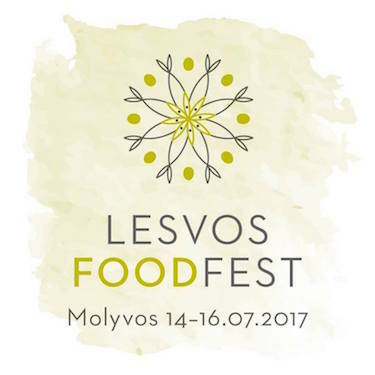 New this year is the Lesvos Food Festival: from July 14 to July 16, in various locations in the medieval looking village of Molyvos. Different locals and chefs will be presenting open cooking workshops, using the ingredients that Lesvos has to offer, like the dairy products from goats and sheep, the often forgotten pulses, salt from the Gulf of Kalloni, a wide range of herbs, olive products, home made pasta and alcohol. They will even show you how to cook in traditional pots of clay. For Greek restaurant owners it is normal that you venture into their kitchens to view what will be on the menu that day. This festival however offers you a chance to have a close look at how the cooks magically turn fresh products into tasty regional dishes. A lot of Greek kitchen secrets will be brought into the open. During another part of the festival you will be let loose in making mezèdes (Greek tapas), experimenting with the rich flavours and forms of all those fresh products. I wonder why sometimes I have the idea that Greek life consists mainly of eating and drinking. Ouzo and fish belong to the sea (ouzo looses its taste the farther you are from the sea). And there is plenty of food on the land. The fields of flowering herbs – an eternal part of the landscape - along with the cooling shadows of the millions of olives, walnut and chestnut trees, and the almond and cherry trees whose blossoms decorate spring, and even the hidden cornfields: they all contribute to the dinners that traditionally are shared by a large number of people. For the food gurus Lesvos is a true culinary paradise, where simplicity and freshness dictate the rules, mixed with sea salt and herbs. rare sighting: no entertainment anymore, no spontaneous singing, nor dancing around the table or a bottle of ouzo. This is how slowly the air for life is being squeezed out of the Greeks. But the Greeks do not give up so easily: this summer Molyvos and Petra will be vibrating with music, singing, dance, food and cheerful people who dare to live, even if they have to survive on souvlaki and tomatoes from their gardens. Kali orexi! OUI !!! LESBOS EST TOUJOURS AUSSI MAGNIFIQUE ! NOUS Y SOMMES ARRIVES LA 1ERE FOIS EN 1992 ET Y AVONS SEJOURNE 16 FOIS ! QUEL EMERVEILLEMENT CETTE ANNEE AU MOIS DE JUIN ! NATURE INTACTE,PROPRETE EXEMPLAIRE(une campagne de nettoyage a été organisée par les habitants en avril! ),CALME ET DOUCEUR DE VIVRE ET LE GRAND BONHEUR D'Y RETROUVER TOUS NOS AMIS GRECS ! NOUS TENONS A CONTESTER LES INFORMATIONS NEGATIVES DES MEDIAS QUANT AUX NUISANCES DES REFUGIES : NOUS N'EN AVONS VU AUCUN !C'EST EN 2015 QU'ILS SONT ARRIVES EN MASSE ET ONT ETE RASSEMBLE AU CAMP DE MORIA ! COMMENT PEUT ON TENTER DE DETRUIRE LE TOURISME SUR CE PETIT PARADIS AVEC DE TELLES INFORMATIONS MENSONGERES ! LES VILLAGEOIS, LES RESTAURATEURS, LES HOTELIERS, LES COMMERCANTS SUR L'ÎLE DE LESBOS GARDENT LEUR FIERTE FACE A TOUS LEURS PROBLEMES ET TRAVAILLENT POUR UN MEILLEUR LENDEMAIN ! A SAVOIR AUSSI ... LE TREMBLEMENT DE TERRE DU 12/6, NOUS ETIONS DANS UN SUPER NOUVEAU BEACH BAR A VATERA ET SOMMES PASSES A VRISA PEU DE TEMPS APRES POUR REPARTIR VERS MOLIVOS. IMPRESSIONNANT OUI, MAIS SURTOUT TRES TRISTES POUR LES PAUVRES VILLAGEOIS... AVIS AUX TOURISTES : CE GENRE DE SEISME SE PRODUIT TOUT AUSSI BIEN EN ITALIE, EN SICILE OU N'IMPORTE OU AILLEURS! .. PARTEZ A LESBOS! DECOUVREZ CETTE GRANDE ÎLE EPOUSTOUFLANTE DE BEAUTE, ALLEZ A LA RENCONTRE DE LA CHALEUR CORDIALE DE SES HABITANTS, PROFITEZ DU CALME ET DE LA SERENITE, DELECTER VOUS DE SA CUISINE ET DE SES PRODUITS LOCAUX ET SAVOUREZ CHAQUE INSTANT QUI PASSE !!! Christine & Peter - Belgique.